Fruity and nutty cauliflower ‘cous-cous’ crunch with a curry maple dressing. 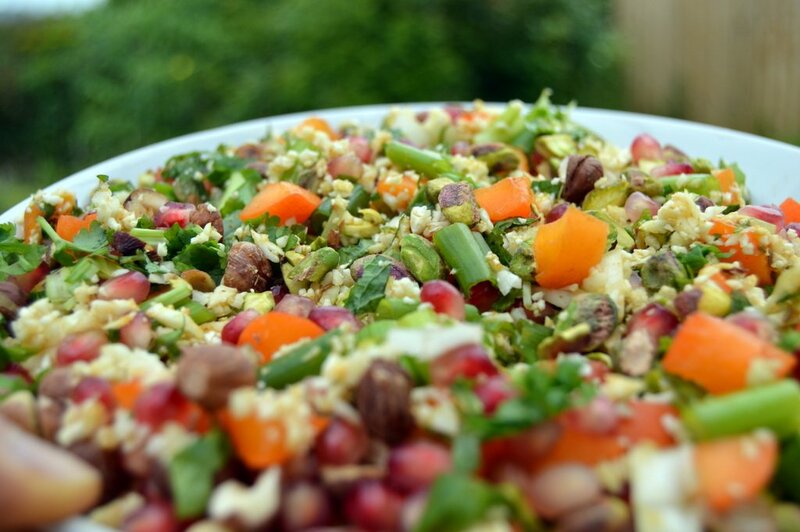 This salad looks very appetising and tastes great with red pomegranate, orange apricots and green pistachios. Perfect for summer days and always proves to be very popular when I make it. Great to bring along to picnics or barbeques. Use whatever curry powder you like – mild / medium / hot. I prefer spicy food so use a hot curry powder made from ground coriander root, turmeric, cumin seeds, fenugreek and plenty of cayenne pepper. If you don’t have maple syrup then any other sweetener such as date syrup (or a few dates blended with water) works well. You can also substitute the apple cider vinegar with white wine vinegar. This fruity and nutty cauliflower crunch is gluten free, dairy free (vegan) and raw (maple syrup is generally accepted on a raw food diet). 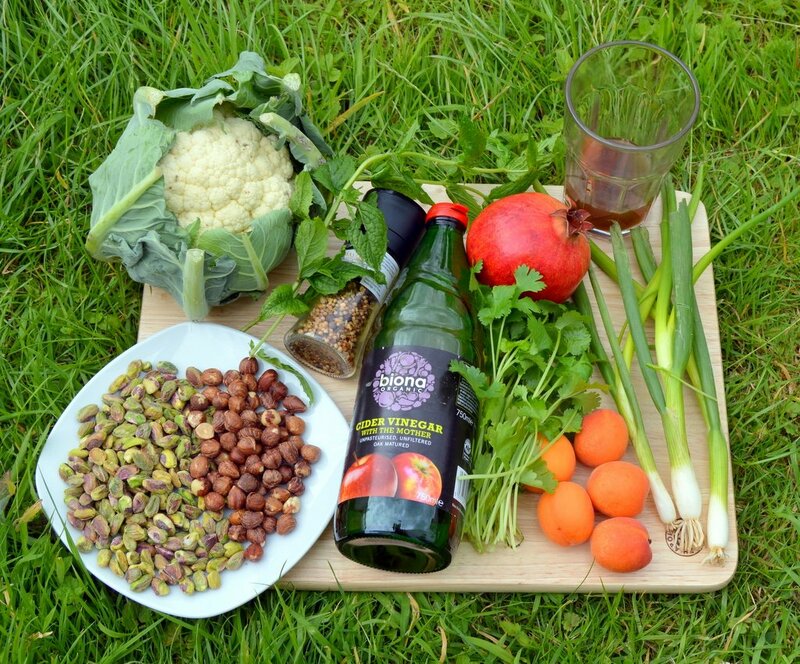 But no need to tell anyone how healthy this is – it just tastes and looks delicious. Pulse blend the cauliflower in a food processor until it’s broken up into couscous sized pieces. It doesn’t matter if there are a few large pieces but you want to avoid over blending and making it mushy. Mix together the curry powder, maple syrup and apple cider vinegar together. Then mix this with the cauliflower couscous. Roughly chop the spring onions, nuts and herbs and then mix everything together and serve. Ready to eat straight away or it will last a few days when stored in the fridge.